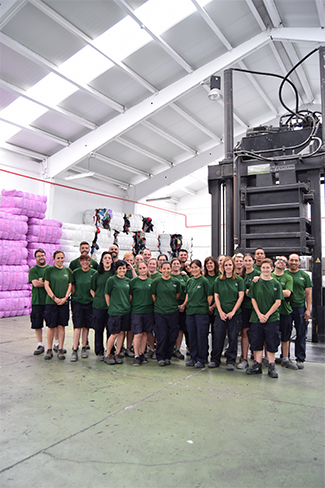 Humana Fundación Pueblo para Pueblo collected 17,983,029 kg of textile used in Spain in 2016 to give them a social purpose. This figure represents an increase of 7% compared to 2015 (16,853,294 kg). The average number of donations per container is also growing by 9.5%. The Foundation has installed 5,100 containers thanks to agreements with more than 2,000 municipalities and private entities. The citizens deposit in them the clothes, the footwear, the complements and the textile of home that they no longer use and to which they are given a second life. The collection of the textile is a free service and represents a significant saving in the costs of collection and disposal of urban solid waste. According to Elisabeth Molnar, director general of the Foundation, there are several reasons behind this increase: "a greater environmental awareness on the part of the citizens, as well as a clear interest to promote a model of circular economy that prolongs the life of the textile; The citizen also bets on giving a second life to his used clothes thanks in large part to the effort that municipalities, companies and entities like ours do to endow it with a social purpose. 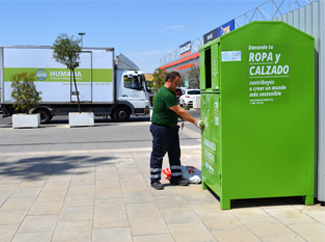 Molnar also believes that "this growth also shows that despite the proliferation of players within the used textile collection sector, the number of citizens deciding to deposit their used clothes in Humana containers increases, since they rely on the model of Valorization of textile with social purpose of the Foundation ". The director general of Humana also adds that, "waste represents a fundamental challenge in the conservation of the environment and in sustainable development. By recovering used clothing, we were able to reduce the overall waste volume of the remainder fraction as well as to enable reuse and recover raw materials. And we do it with an objective: to extend the useful life of the garments and to promote social projects ". The reuse and recycling of textiles contribute to the protection of the environment and to the fight against climate change. In addition to recovering garments, it is avoided to landfill, contributing to the reduction of greenhouse gas (GHG) emissions. Each kilogram of clothing that is reused and not incinerated avoids the emission of 3.169 kg of CO2, according to data from the European Commission. The 17.9 million kgs collected last year represent a saving of 56.9 million kg of CO2 to the atmosphere, which the planet is grateful for. Or what is the same: it means that 3.1 million cars stop circulating for a day or that 913 million trees stop absorbing pollutants, also in a day.